Psst…I’m going to let you in on a little secret; I’m not terribly creative. Actually, I’ve always believed myself to be rather creatively handicapped. I’ve struggled with creating stories as an adult. I can’t lie because I can’t dream up a creative enough story. My mind just doesn’t stretch itself that way easily. But lately Katie has been increasingly interested in pretending and I’ve had to push myself more than a bit. Yesterday, she was sitting on the floor, playing with her Polly Pockets while I was puttering, tidying up, sorting the mail, and emptying the dishwasher. I looked over at her and she looked so sweet. And so alone. We took turns with her dolls and I truly got lost in the moment with her. We traded off driving the boat and the van. We took turns with the scooter and the wake board. Katie generously let me use the only pair of sunglasses. We played for about twenty minutes, but she talked about those twenty minutes afternoon and evening. That’s all it took…twenty minutes to make her day. Twenty out of 1,440 minutes in the span of an entire day. The dishwasher sat half empty, but her heart was filled to the brim. Last night, when I reviewed my day, those were the best moments by far. 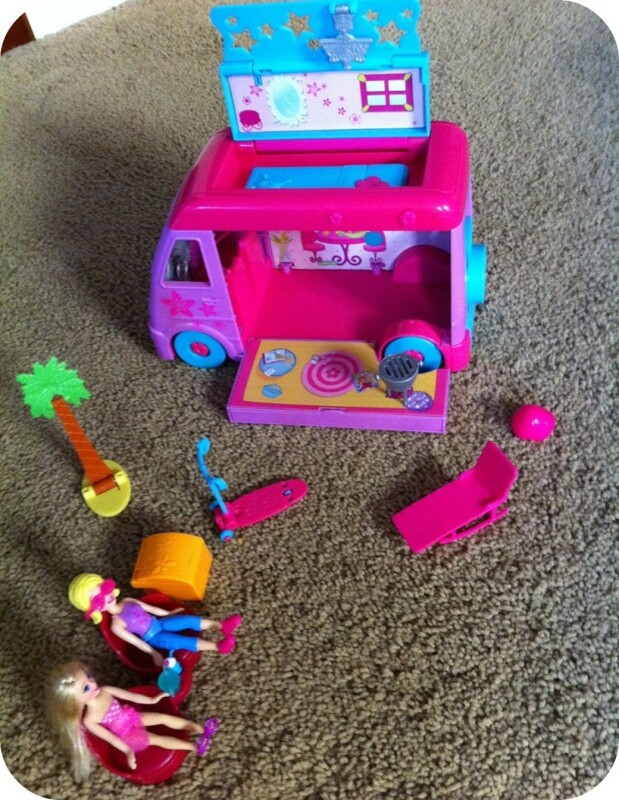 And I learned that I can pretend the heck out of the Polly Pockets. I already know which I’m putting on my Christmas list. Who says I’m not creative? You are my hero. I can't play that stuff for more than 5 minutes without wanting to stick one of those teeny shoes in my eye. Also? Who says you can't pretend??? wow that is so cool how giving her twenty minutes of play time and attention made her day. Plus what a great way to spend twenty minutes while getting to put off dishes for a little bit longer haha. Now that is doubly time well spent. I often have the same problem. My kid has an amazing imagination and mine has much left to be desired. I play along as best I can… but it takes a lot of effort on my part to even get to that point. BUT, I know exactly what you're saying when you spoke about seeing your daughter all content with herself but oh, so alone. I have seen the same thing in my son and acted in the same fashion you did. It almost makes me want to have another one. Okay, well not quite … but it does cross my mind every now and then. How wrong would it be to have a kid for the sole purpose of providing entertainment for the older one? I once got a cat for my dog to play with … same thing, right? I've always said that if you give your child 20 minutes of undivided attention, they are good for the day. Sadly, we don't always feel like we have even 20 minutes to spare in a busy day. 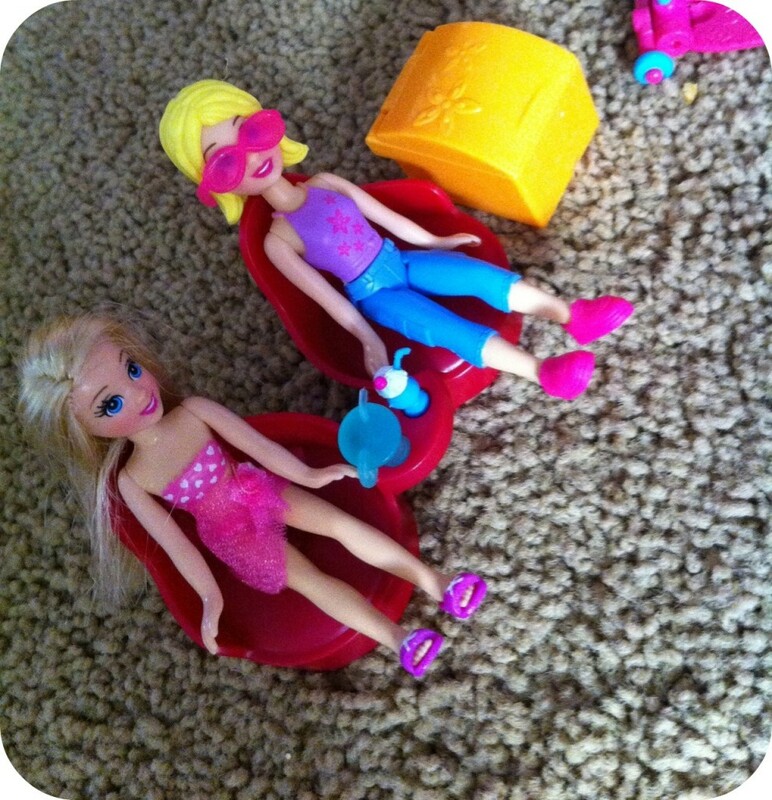 I loved this, "I can pretend the HECK out of polly pockets!" this is awesome. Eddie and I definitely play and pretend lately. It's his new thing to bring you cups to "drink" your milk. It's so cute. We also play trucks and build things. I have NEVER ever liked playing with little kids. I get bored so quickly…but with Eddie it's different. He is just so funny about things! Double goodness…not only did you have 20 minutes of fun playtime with your daughter…but you get the extra prize of enjoying her being thrilled about it for the rest of the day. Big mommy heart swells. It's so rewarding to feel like I've done something like that to really make my son happy. It makes me feel good all day, too. I think you should get some Littlest Pet Shop too. Polly needs some pets. How can you resist a Katie?? Sigh. I need to do that later tonight. Though I actually can be very creative (without tooting my own horn), it is stories like this which make me feel like “I can’t wait to find the right person and start having kids.” Thanks for sharing. Creative or not, I love that you took a time out to play with her. Those extra minutes where we drop everything to go do something simple with our kids… often turn out to be the best minutes of my day, too. I need to learn to do more of that. I love to play. I didn't have many toys at all growing up, and so I'm catching up now. You need to get the wee little pet shop. FUN. With a capital F.
I remember when our house was filled with Polly and her supplies. The girls' favorite was a pool. Came with a slide and all sorts of pool accessories and a small tank in which tiny plastic fish and sea-horses swam in an endless circle. So it would feel more like the beach to Polly and her friends. The pool itself (and the small tank of fish) required endless trips with small cups of water. From the sink to the pool and back. Water everywhere. Everywhere. I seem to remember that there were Polly Pocket dolls whose hair changed color in the water. You're going to need towels. Water will be everywhere. Getting in and playing has always been a struggle for me, too.Getting in and playing has always been a struggle for me, too. But I can spin a yarn with the kids all day. So, sometimes I narrate and or throw out suggestions while they're playing. Like, "and then it started snowing," or, "Look out! Yak!" Aww, that sounds like the best day ever! I keep trying to remind myself of this- that it doesn’t take much to make my preschoolers’ day. You hit the nail on the head, Nichole. It takes SO little to make such an impression on these little ones, but it's so hard for us to pull away from other things sometimes. Once you get lost in the fun and not distracted, it really does pull you into a different zone! I loved the Polly Pockets, by the way. Had a harder time with the dinosaurs and Bionicles, but I sure gave it a good go! So, so sweet! I really need to do a lot more of this. your post made me weepy. I have a hard time too. Sometimes I get SO bored when I'm playing but only if I don't focus. If I focus on just playing and not worrying that I Should Be Doing Something Else I have a great time.